Let's Just Write ON the Windows, OK? Do you ever have these bright ideas when you are shopping? You come across something in the aisles of the store that you didn't intend to buy or use, and find it in your shopping cart? 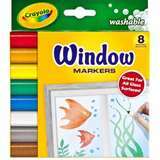 That is what happened when I walked down the school supply section and came across these babies....Window Markers from Crayola!!! I couldn't believe they actually make markers that can write directly on the window! Now, if you know anything about me by now, you know that I like anything that is slightly "different" when it comes to my classroom. I like to do the old standby stuff, but throw just enough "twist" in to make it fun. So, when I saw these, I couldn't pass them up. I threw a few 10 packs in my cart and was off. After the rough drafts were done, the fun began. We moved the tables out of the way, set it up, and were off to coloring the windows. They basically followed their plan, used the markers, and had a BLAST! My kids really loved doing their artwork on the windows. They were a bit "off" with the writing, as there were no lines, but they managed. The greatest thing about these markers is that they come off so easily! I gave each section of kids a pack of wipes and tissues, and mistakes were taken care of in no time. Here are a few pictures of the process. This took us about 3 days to complete, from rough draft to final window product. I have to tell you, the finished product looks amazing. The pictures don't do it justice. When you first look at it, you can see there is something there, but not exactly what. It isn't until you walk up close that the full force of the work is there. I actually did the title window pane myself, calling it "Walking the Freedom Trail" (which you can't see in this picture. I took the picture before I did it, which is why there is a blank piece of glass), so I put little footprints along the entire thing. The footsteps follow the progression from pane to pane of the events in date order. Seriously, I am in love! My class this year would have DIED to write on the windows like this. I'm sure next year will be the same. I will keep my eyes out for this - thanks for writing about it! What a great product! I'm your newest follower. Stop by my blog sometime. May I just say that you are the coolest teacher ever? You are always doing the most amazing things in your classroom! What a great way to use those windows! I'm sure your kids will remember this one for a loooong time. Thanks for sharing. I would love to come see your classroom and your windows. What a neat idea. I get so excited when I see your posts in my inbox. Thanks for the inspiration. I love, love, love this idea! I did something similar with the time line, except I had them do it in chalk outside the classroom. I love that with the window markers, they can stay inside and their work is preserved.... Great find! I LOVE these markers! I have used them the past two years as a classroom reward system. Students who get fifteen tickets for good behavior are able to write their names on the window, which then stays there for the following years. My fifth graders love this, and the best thing is it costs basically nothing! I really like your idea of using them for a teaching lesson as well! I'm going back in your blog, soaking up all your ideas. =) Are these markers like the expo ones? I know the expo markers comes off really easy on glass, just wondering what the difference is.